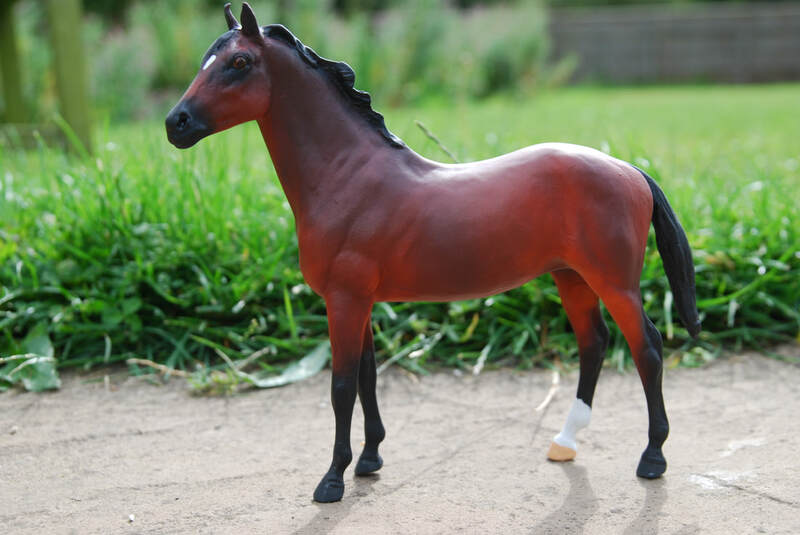 The model used is a Breyer Classic Duchess. 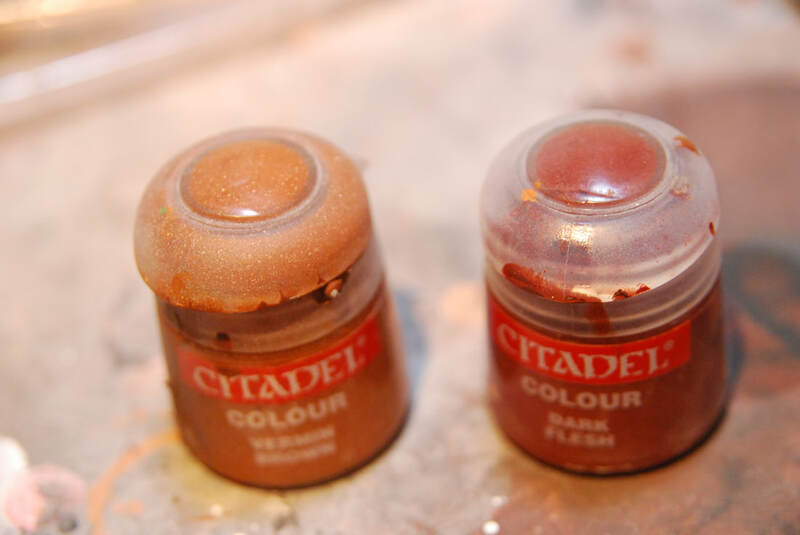 The paints used were citadel, this paint range has since changed but there is information online about equivalent colours in the new ranges. Approximate costs are based on you buying all the items needed for this tutorial including a cheap airbrush and compressor. 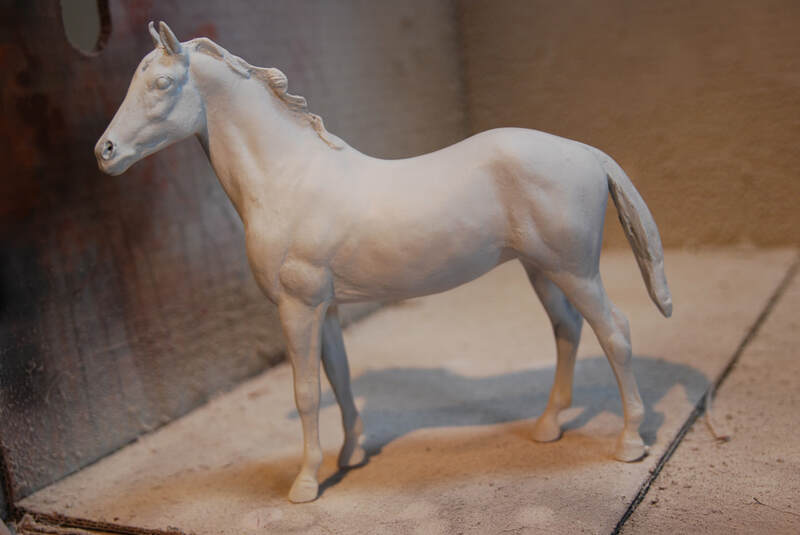 It is assumed you are painting a Stablemate model horse but this tutorial will work for all scales. 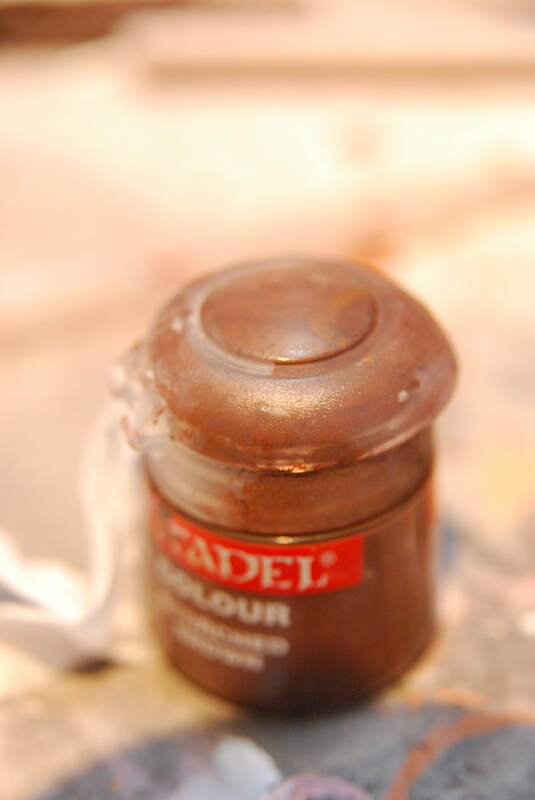 Your first paint colour will be Vermin Brown (or any light ginger brown). 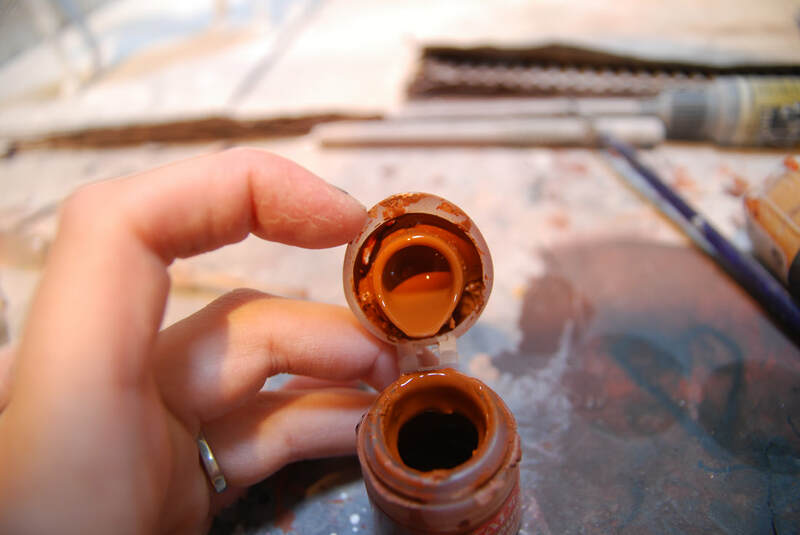 You will need to mix it to about the consistency of milk, as you can see the Citadel paints are quite thick so need watering down. Water will work fine for this. 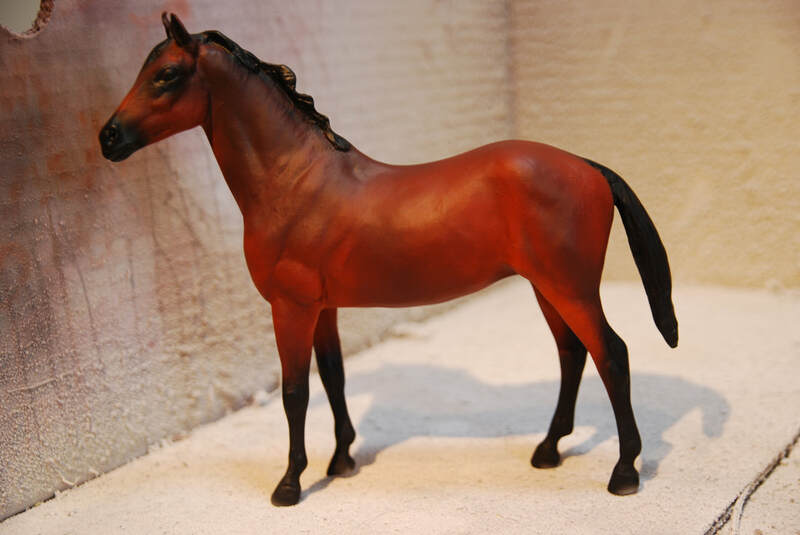 You will need a prepped model horse. 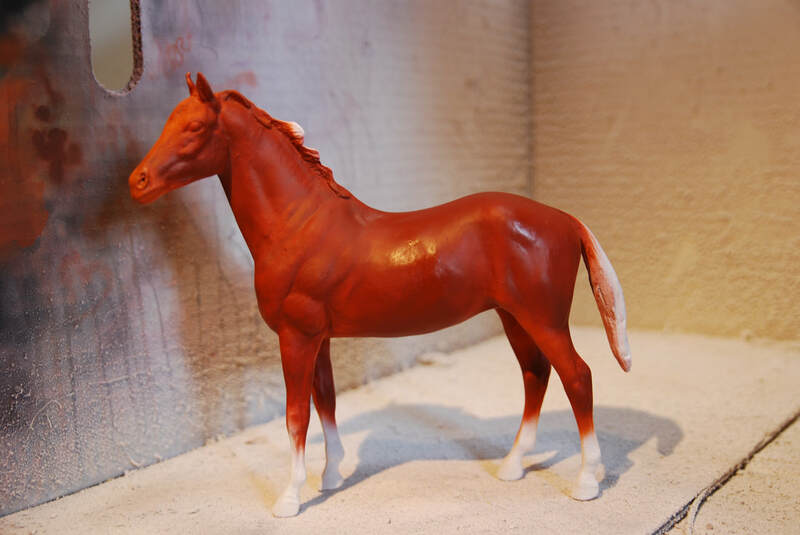 We are using a Classic body for this tutorial but any model horse will work. Make sure there is a smooth covering of white primer as your base. Spray Vermin Brown over the parts of the horse shown below. Leave the white areas as this will change the final colour. Mix together equal parts of Vermin Brown and Dark Flesh, make sure to water down. Cover the whole horse in a light coat. Now start to add shading around the areas that were left white in the previous step, the cheek, the neck and around the joints. Use reference and the image below to help guide you. Now get some Scorched Brown and water down. Spray this around the neck, withers and joints (see image in Step 7). Spray black around the muzzle, eyes, legs, mane and tail. Note the darker areas on the body where Scorched Brown was added in Step 6 (apologies for the missing image). 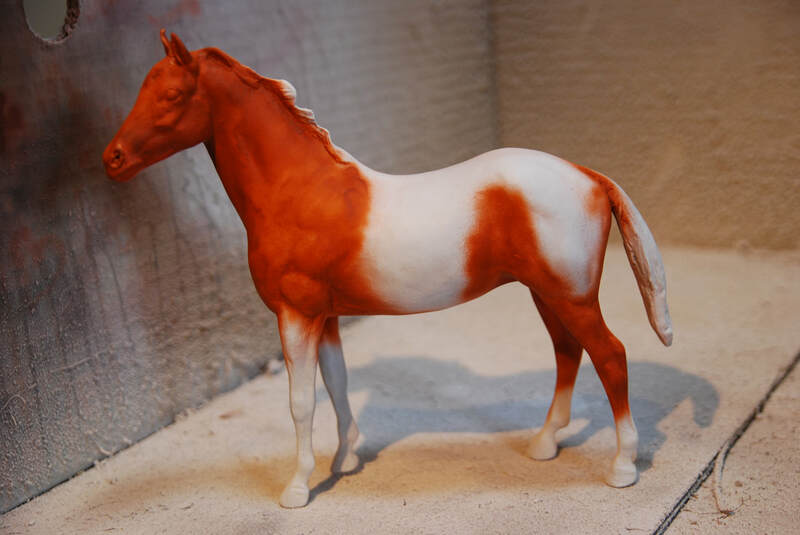 You can now finish off your piece by hand painting details and adding any markings you wish to add. This is a very simply four colour tutorial that shows you how you can create real depth with a very limited number of shades. You can take the piece a step further with more shading and by adding pastelling within the muscles for more depth. If you have followed this tutorial we would love to see a picture. Email catriona@chestnutridge.co.uk and we will add it to our gallery of completed pieces. My own finished piece. I added a white sock and star before finishing details such as the eyes and hooves. Painted in 2011.